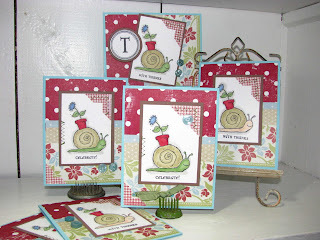 Great take on the inspiration challenge...very cute cards. SHUT UP! These are SO CUTE!!! I think your mojo was just sitting in the corner waiting to come out! And, he is DEFINETLY out now!!! I'm so glad that girl, Lana Lepinski, stamped some of these babies off for you! Love these LZ! I think you are nuts for not liking any of your work for the past month! Maybe you should open up your eyes when you look at them! Ha ha! These are great cards! I love the color combo! Very nice! YOU...Not in the GROOVE??? Dang chickie....you can't get any "groovyer" !!!... Someday I hope to be half as good as you. Keep up the good work...and Thanks for all you do. I love your cards.....always!!! I love these....they are so cute! They just make me smile! It's official....the mojo draught is over and creativity is flowing again....although I TOTALLY disagree with your assessment of the projects done this past month. I thought they were WONDERFUL!!! 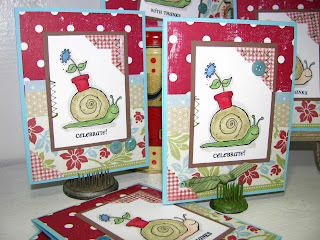 As for these sweet cards...I LOVE THEM...LOVE the stitching on the corner punches and along the side of the image. The mixing and matching of the paper is FANTASTIC too. Keep 'em coming, LZ! These are SO cute! Love the image and the colors you used.